The National Geographic called it “Place of a Liftetime” and according to the Huffington Post, it’s the world most interesting restaurant. 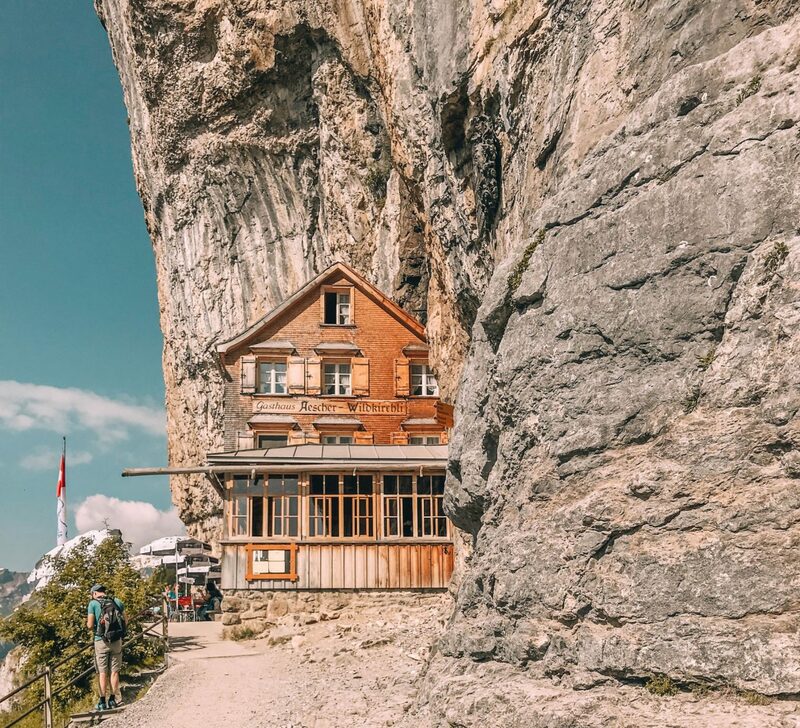 The Äscher Cliff Restaurant “Berggasthaus Äscher Wildkirchli” is clinging to the foot of a vertical cliff and is almost 200 years old. It used to be a place to shelter farmers and their animals. 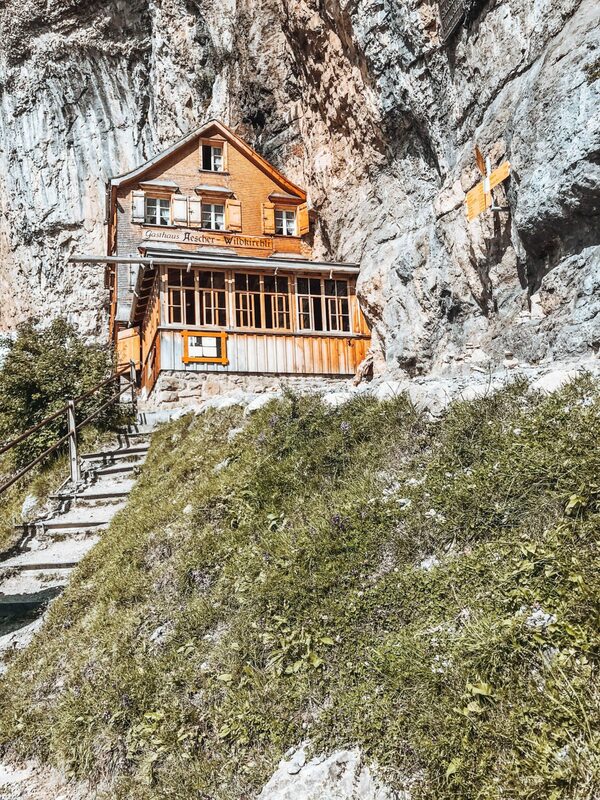 Later it became a guesthouse for pilgrims, because of the nearby chapel and for hikers and mountaineers. Today it’s a restaurant that serves typical swiss food and spoils you with a stunning view over the alpine scenery. 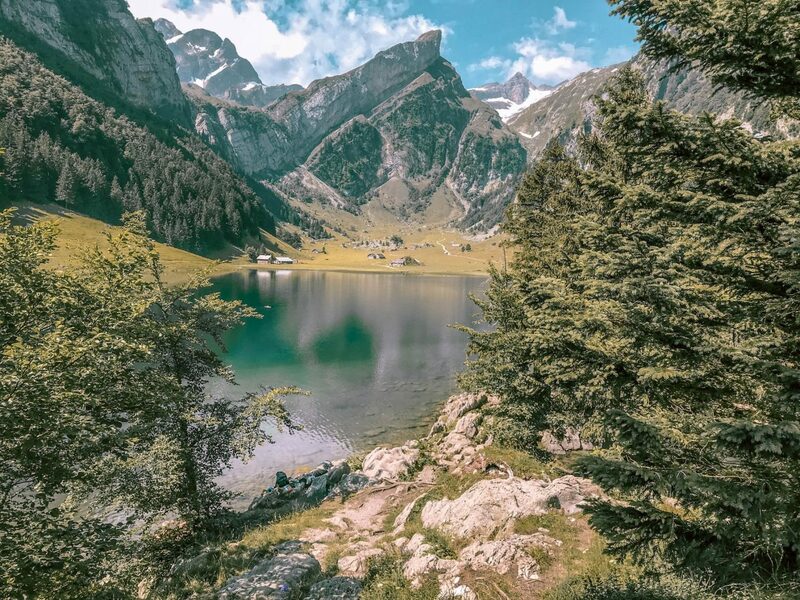 Location: The Äscher is located in the “Canton of Appenzell”. An area of Switzerland that is known for cheese, cows and their cute villages. How to get there: Whether you decide to hike(see below) up there or take the cable car, your start is in Wasserauen. This tiny village is about 1.5 hours away from Zürich by train and 3 hours from Lucerne. The Cable Car Station to Ebenalp is across from the Train Station. From Ebenalp Station it is a 15 minute walk to Bergasthaus Äscher. 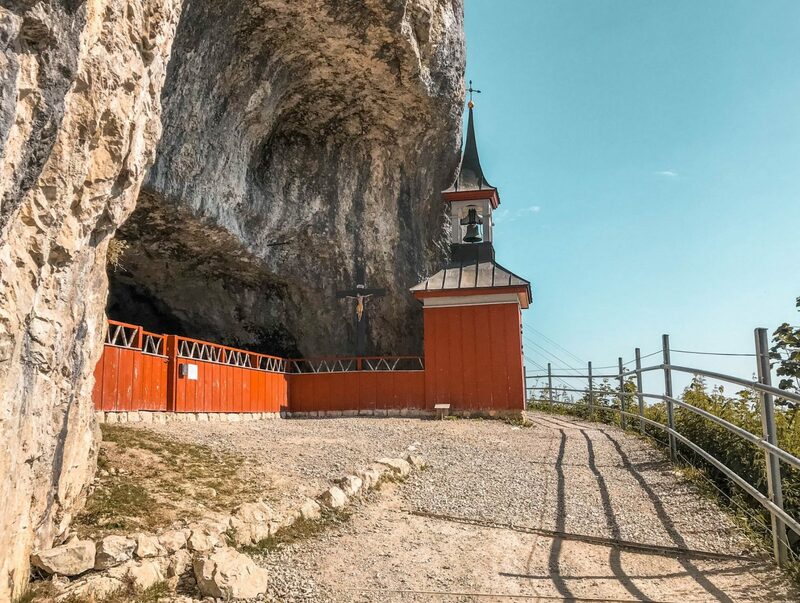 The trail passes through caves and a chapel. Everything is secured, but especially in the caves it is very slippery, so good footwear is recommended. What to do: Eat traditional Swiss Rösti, Enjoy the view, breathe the good air and take lots of pictures. You can take the cable car back down to Wasserauen or hike down. If you choose to hike down to Wasserauen you won’t regret it. 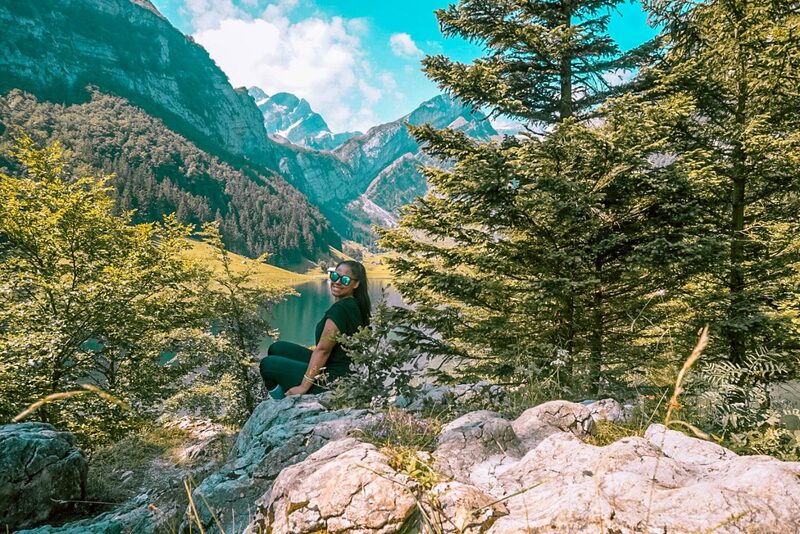 You will wander through narrow trails, cow pastures, and the beautiful alpine Lake “Seealpsee”. It’s all downhill and it will take you about 1.5hours. The Hike: The hike begins in Wasserauen right across from the train station. The trail is well signposted, so you can’t miss it. 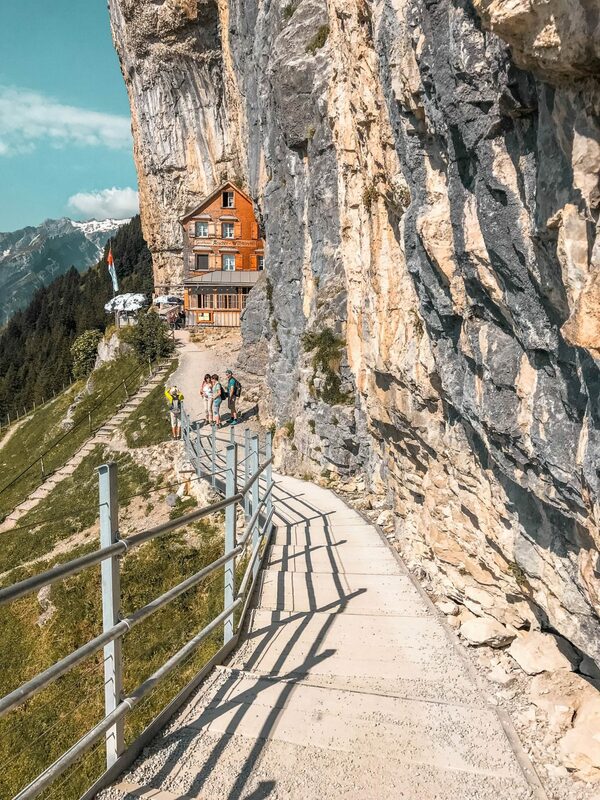 After about an hour you will reach the picturesque Seealpsee, with the mighty Mount Säntis in the back mirroring on the lake. After a tour round the lake a rocky mountain path from Seealpsee to Äscher will follow. This path is narrow, quite steep and sometimes skirting along the cliff side. You will need good and stable footwear. From Seealpsee it will take you 1-1.5 hours to reach the top and enjoy a delicious swiss lunch at the Äscher. You can either hike down or take the cable car which brings you in around 3 minutes back to Wasserauen. Oh, wie schön! Diese Wanderung muss ich unbedingt auch machen. Wow, Switzerland is just an amazing country. I would love to do that hike. 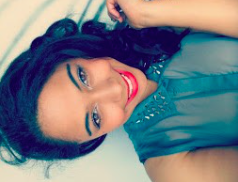 Have wonderful rest of the day! OMG, this place looks stunning!!! !